These past two weeks, dad and I have been working rearranging the cabinets. 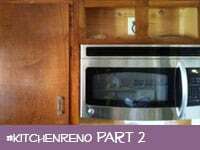 In my last post I went over the demo, installation of a new cabinet, and installing an over-the-range microwave. This week I will cover what we’ve done to complete the cabinet installation! Our first step was to cut the countertop overhang next to the range so it can slide to the left about 1.5″. This was done with a simple jigsaw. The overhang needed to be removed in order to slide everything over to the left. 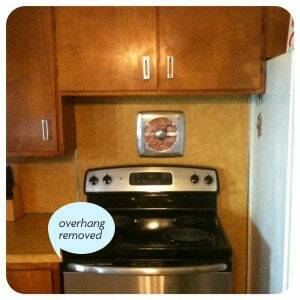 This gave us the extra room to add a new 9″ base cabinet to the right of the fridge. Once the countertop was cut, we slid the range right against the edge of it. 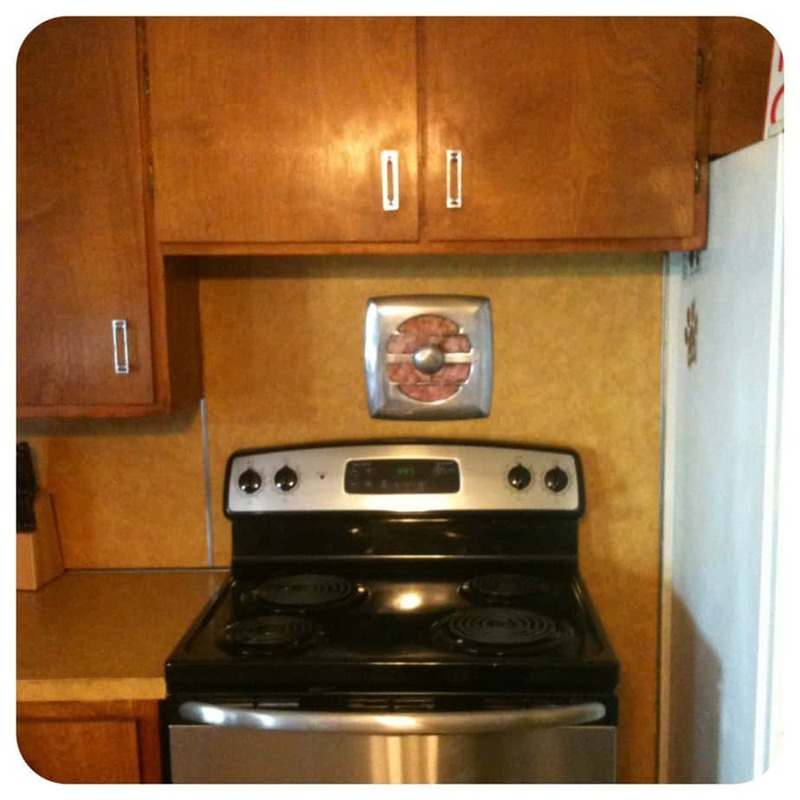 Now, it lines up with the above-the-range microwave we installed last week! After sliding the range over, we were able to slide the refrigerator to the left against the range and new microwave. 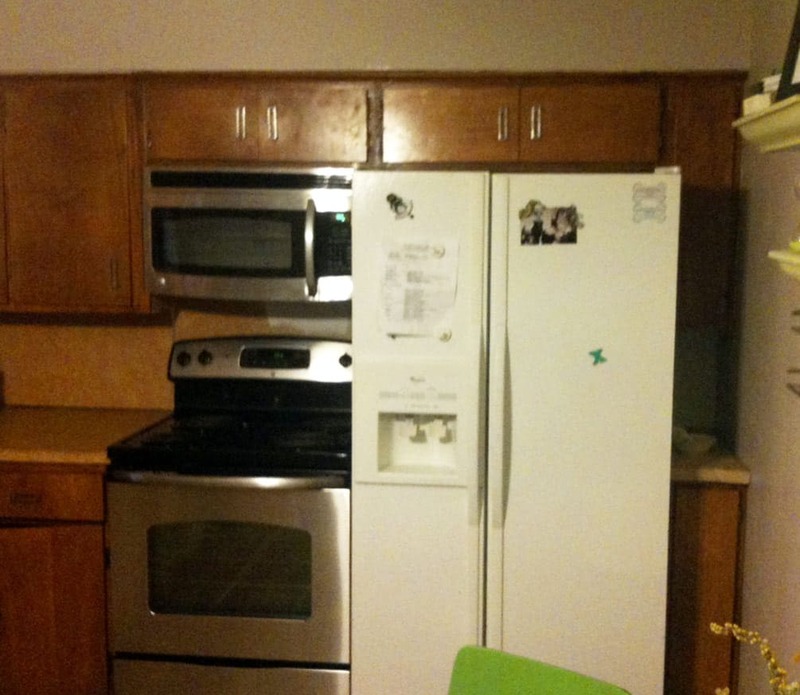 We installed a 36″ x 12″ stock cabinet above the refrigerator. This was much easier than installing the cabinet above the microwave, as it didn’t need to be reinforced to hold the weight of anything. 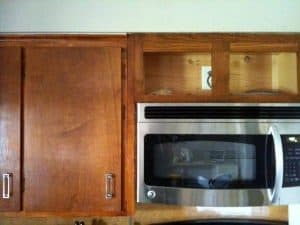 Because we wanted the new cabinets to integrate seamlessly with the existing ones, we took great care when demoing the old cabinets, in hopes that we could use the doors and filler pieces as the new doors for the 30×12″ and 36×12″ cabinet. Not only did this save us time, money, and frustration, but it really makes the new cabinets look like they’ve been there all along. My dad used a planer to cut down the wood little by little until they were the right dimensions. We attached door hardware to them that matches the hardware on the other cabinets, and used hinges that we carefully matched to the existing ones. 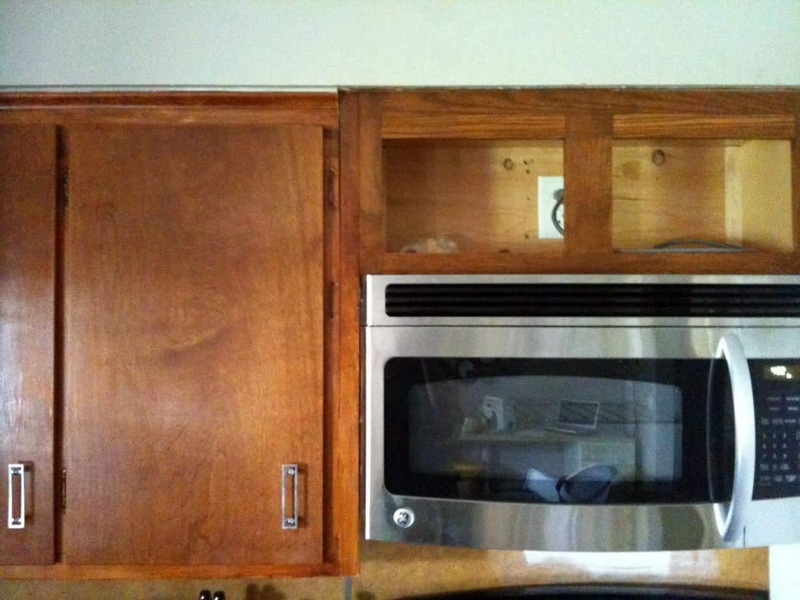 The cabinet (without doors) above the microwave was stained using the Sherwin Williams color match. The cabinet to the left of it is original to the kitchen. Not a bad match, huh? Staining the new cabinets was a very difficult process. The goal to make them look like they’ve always been there took a lot of research into the stain color that needed to be used to give that look. After bringing an existing cabinet door to the hardware store 3-4 times and coming up with stain that looked nothing like what I needed, I decided to get some professional advice. So, I went to Sherwin Williams and found out that they have a paint and stain match service that is no charge to their customers! What a great idea, and a lifesaver for me. I brought in my existing cabinet, and an unfinished wood door from one of the new cabinets, and they calibrated everything to match. The process can take a few days, but the result is well-worth the wait! The new stain color is very, very similar… I couldn’t be happier with the result. The 9″ wall and base cabinets that we needed for the right side of the refrigerator unfortunately area custom size that you can’t buy at the big box store. After scouring the internet, I came up almost zero results for what I needed. So, I decided to hire a local carpenter to create cabinets for me that would match the rest of the kitchen. While I was add it, I asked him to make a wine rack inside the base cabinet for me — a very cool touch to my new project 🙂 Working with a local carpenter is usually a very easy process. They can help you a lot because they know the wood species that you are trying to match, and can recommend something with a similar grain, that will be easier to stain-match. They also have access to tools that can make the cabinets come out much more professional. The carpenter came to my house and measured everything himself. He built the cabinets at his workshop, and returned them unfinished. Because I asked for them unfinished, it saved me a significant amount of money. This is a great tip for anyone looking to get a great quality product for a smaller price-tag. I already had the custom-matched stain so why not do the work myself? I will give you fair warning: Don’t assume that the carpenter did things correctly. Just because he’s a professional does not mean that you have the luxury to be lazy. Take the measurements yourself, and while he is still there, make sure you measure the new cabinet to be sure its correct. Unfortunately, the measurements were wrong the first time he built mine. 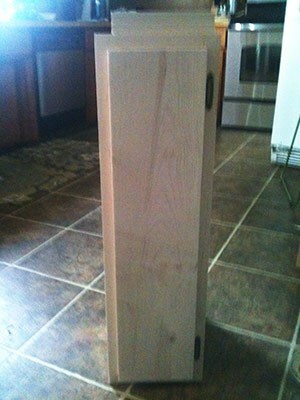 I made him redo the upper cabinet to accommodate the molding and make sure the door would line up with the rest of them. the second time, the measurement was STILL wrong. So much for hiring locally. The 1/4″ it was still off was not enough for me to hassle him about it… my dad and I were able to compensate for this difference when we hung the cabinet. However, 2 mistakes on a small project definitely made me question if I will use this particular carpenter again. I wont. After the cabinets arrived, I stained them with the same stain from Sherwin Williams, coating them with 2 layers of polyurethane, and up they went! Until I get a new countertop, my dad cut a block of wood to size to use as a temporary countertop over this small 9″ space. It’s been a very labor-intensive and difficult project to get this new layout in place. But I’m sure as time goes on, I will forget about all the hard work and curse words I’ve learned along the way, and will be able to enjoy my cabinets for years and years to come. Again, the final product: Removed the overhang of the countertop, shifted range and fridge over, installed an above-the-range microwave, installed 4 new cabinets, and matched the stain and reused materials so it looks like it’s always been this way! Waiting on the hardware for the new 9″ cabinets. Once they come, I’ll install them and put the shelves in. Pick new countertops and have them installed. This is huge, guys! I’m soooooo excited!! Choose a new backsplash and install it. Also very exciting, but I’m trying not to think about it until I pick the countertops!